Barbecue rocks my world. LOVE it! BUT… and this is a big ol’but (tee!) it is hot, hot, hot outside. And who wants to heat up the house even more? Not me! This recipe is so easy. 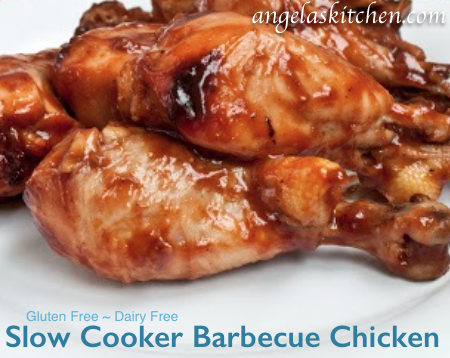 Just pop in the crock pot, go play outside, and eat when you are ready for dinner. What could be better than that? In a small saucepan mix together ketchup, brown sugar, lemon juice, mustare, Worcestershire sauce, ginger, garlic and red pepper flakes (if using). Cook over medium heat until brown sugar has melted into sauce. Oil the crock of a slow cooker. Lay chicken in crock and pour only half of the sauce over chicken. Cover remainder of the sauce and put into refrigerator. Put lid on slow cooker. Cook on low for 6 to 7 hours until chicken is tender and cooked through. When ready to serve, heat the reserved sauce and serve with chicken. You can also bake the chicken in an oiled pan (again covered with half the sauce) at 350 degrees F for about an hour.